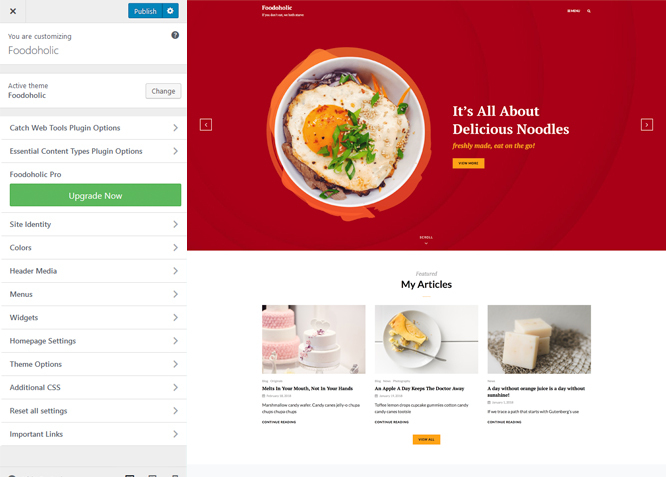 Foodoholic is a clean, simple, and aesthetically pleasing WordPress theme for restaurants that is completely free of cost. It has been crafted with minimal design to put your restaurant business first. 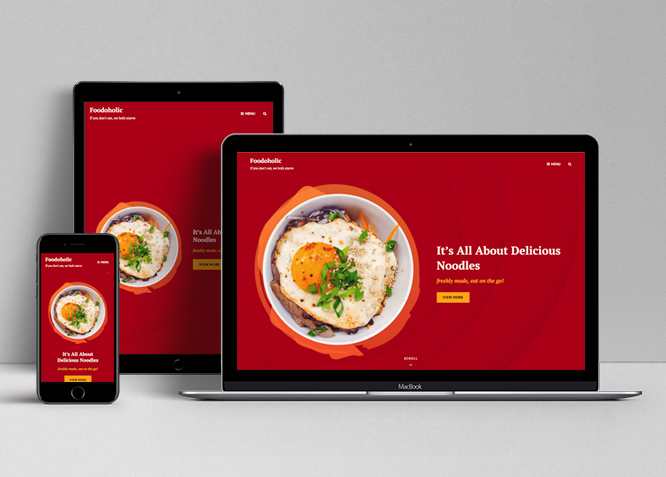 Foodoholic is a highly customizable and extremely user-friendly multipurpose restaurant WordPress theme that perfectly shows off your cuisine on your website and will look flawless on all devices. 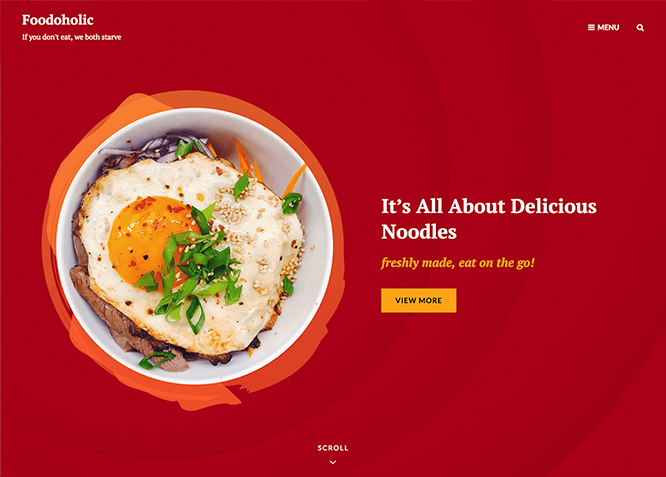 The well-designed restaurant WordPress theme, Foodoholic provides you with basic features—such as header media, featured content, featured slider, food menus, hero content, services, testimonials and more—that are extremely crucial to create a delicious-looking website in just a few minutes. It is a free version of Foodoholic Pro and has a welcoming and engaging appearance with simple menu pages. Also, Foodoholic is translation-ready. For more advanced features, check out the premium version – Foodoholic Pro. Foodoholic offers exciting Menu Options! This theme supports and recommends using "Custom Menus". You can create Custom Menu through "Appearance => Menus" from your WordPress Dashboard. #How to add Food Menu? Foodoholic Supports Custom Post Type as food menu. #How to add Food Menu Essential Content Type? Foodoholic has 2 Default Layout, 2 Homepage/Archive Layout, 2 Single Page/Post Image layout to choose from "Appearance => Customize => Theme Options => Layout Options"Default Layout Once you are in Layout Options, you can Check the box below "Default Layout Options" which will set our site layout. Further, you have the choice of selecting custom layout for individual pages and posts through "Catch Foodmania Options => Layout Options", which you shall find below individual posts and pages, when you click on them for adding/editingHomepage/Archive Layout Once you are in Layout Options, you can Check the box below "Homepage/Archive Layout" which will set our layout for Homepage/Archive Page. Further, you have the choice of selecting custom layout for individual pages and posts through "Catch Foodmania Options => Layout Options", which you shall find below individual posts and pages, when you click on them for adding/editingSingle Page/Post Image Layout Once you are in Layout Options, you can Check the box below "Single Page/Post Image Layout" which will set our posts/page image layout. Further, you have the choice of selecting Single Page/Post Image Layout for individual pages and posts through "higher-education Options => Single Page/Post Image Layout", which you shall find below individual posts and pages, when you click on them for adding/editing. Foodoholic supports Custom Post type as service. #How to add Service Essential Content Type? #How to add Testimonials in theme? Foodoholic supports Custom Post type as Testimonials. Catch Foodmania Pro currently has 17 widgetized (Sidebar) areas thay are: 1. Sidebar, 2. Footer One, 3. Footer Two and 4. Footer Three. Go to "Appearance => Widgets" or "Appearance => Customize => Widgets" in WordPress. Foodoholic has 2 Widgets to choose from. They are: 1. CT: History Widgets and 2. CT: Social Icons. You can add widget in widget area as per your need.